In order to sample the fresh, Mediterranean cuisine at MariscCo, you’ll need to venture in to the heart of the Eixample neighbourhood. 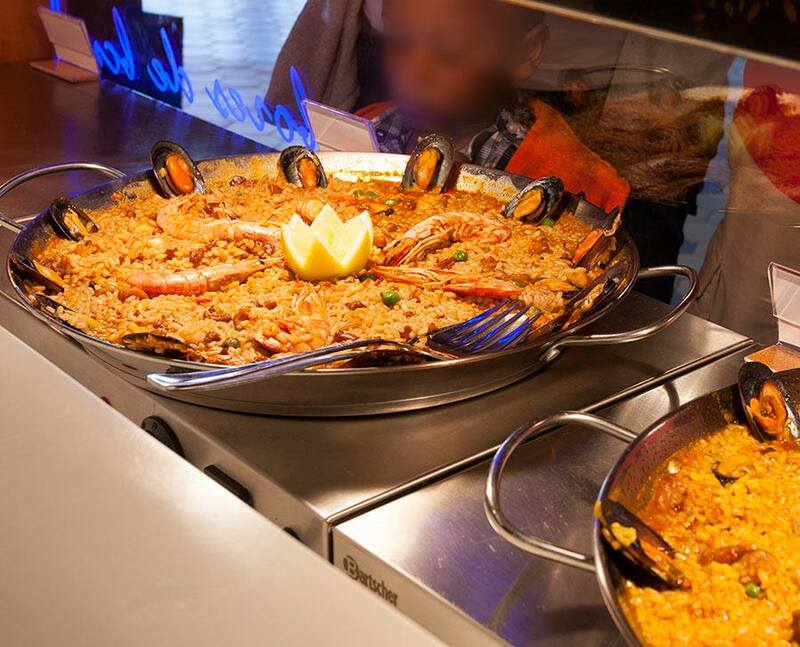 Although this area isn’t renowned for it’s seafood restaurants, MariscCo serve up some of the freshest, tastiest seafood around – including paella! Upon entering, you are put in charge of choosing what seafood you would like, and how it is prepared. If you’re not sure, the always helpful staff are always on hand to give you suggestions. Admire the modern interior and fresh smell of seafood inside or chill out on the spacious terrace, which is open all year long. What’s the best part of this seafood restaurant? It is undoubtedly the outside terrace positioned just at the foot of the beach. 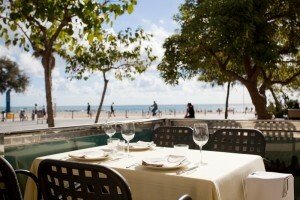 Enjoy a delicious rice dish or a cocktail along the beach-front and soak up some of that warm, Mediterranean sunshine. For just 25€, enjoy a first course, main course, and dessert accompanied by your choice of a drink. In the midst of some good conversation, accompanied by the melody of the waves, you’ll feel the Barcelona allure that keeps people coming back time and time again. Ever wondered what makes paella so special? Take a visit to Gusto’s open kitchen and witness some paella preparation for yourself. Large dishes of paella are prepared here which are ideal for one person or even to share between a party of two or more. With two of their locations inside shopping centres in Barcelona, and the other in the heart of Barcelona, Gustos is the perfect place to take a break from your busy shopping spree or long day of sightseeing, enjoy a tasty bite to eat, and maybe even indulge in a glass of wine from their fabulous selection of house wines. Amongst all the restaurants around it, La Fonda has a reputation as being of the best paella restaurants in Barcelona. Located by Port Olímpic, this spacious restaruant is ideal for small and large groups of up to 60 people. Many of their dishes priced under 15€, but the menu of the day for 11€ is always a great option. With such a delightful and sociable environment, you’ll not only fall in love with the food here, but the atmosphere as well. This charming restaurant, alongside the harbor of Barcelona’s famous Port Vell, is a great place for people-watching as visitors from all over the world make their way over to the Barceloneta. Their tranquil atmosphere makes Cal Pinxo an ideal destination to get some sun while sipping on a glass of wine, and enjoying a tasty paella. 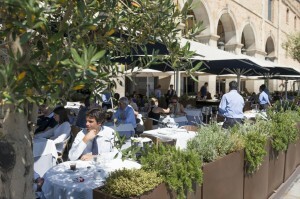 It won’t be too hot, of course, as their terrace offers the perfect combination of shade, and Barcelona’s always gentle, Mediterranean breeze. Elche was one of the first restaurants in Barcelona to specialise in rice and paella dishes, and is often referred to as the “temple for paella lovers”. They hold true to this statement as their dishes always taste delightful and are beautifully presented. If you can’t decide on just one, consider ordering a variety of larger dishes for the whole table to share, but make sure to leave room for dessert because after taking one look at their list of options, you’ll want them all! Located along Barceloneta beach, with fresh ingredients delivered to the restaurant every day, Can Majó truly is a paella paradise! No matter what your favourite seafood dish, or how adventurous you are willing to be, with their list of options, you are sure to find something to tickle your fancy. This family-owned business is closed Sunday nights and all day Mondays so make sure to plan your visit accordingly. Popular with locals and tourists alike, this hole-in-the-wall seafood restaurant, located in the Raval neighborhood, offers a grand variety of seafood, tapas and excellent paella dishes. There are even options for non-seafood lovers. If you’re open to trying new things, we recommend the pulpo (octopus) for a truly unique Barcelona dining experience. Don’t fall in to the paella tourist trap in Barcelona! 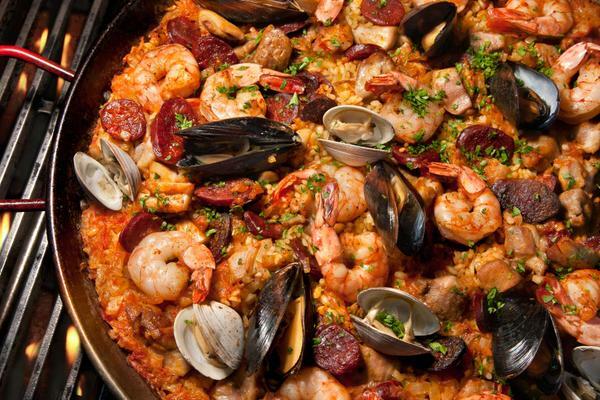 Dine at one of these top restaurants and you’re guaranteed to sample a tasty paella worth bragging about! This entry was posted in Home, Places, Restaurants & Food, Things to do, Tourist Guide and tagged areas in barcelona, barcelona, Barcelona culture, Barcelona food, barcelona food and drink, barcelona restaurants, barcelona tourist guide, barcelona traditions, Paella Barcelona, Paella restaurants in Barcelona, seafood restaurants barcelona, things to do in barcelona, tourism in barcelona, visiting barcelona. Bookmark the permalink.